The Roman Empire changed the face of the world with its innovations in the realm of the military, civics and engineering. 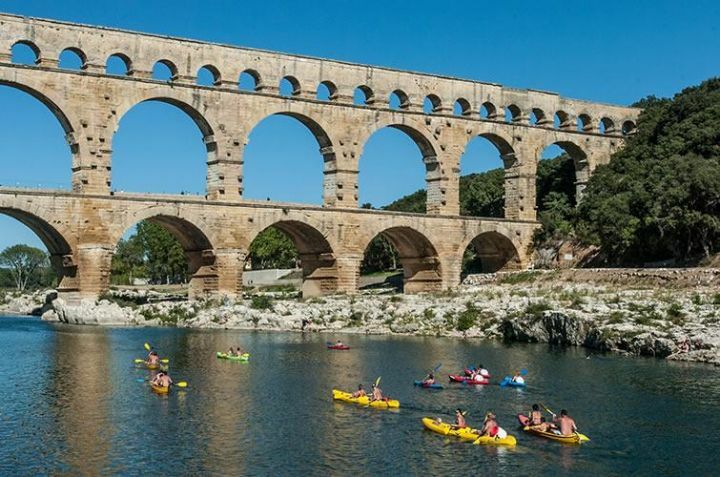 One of those innovations was the creation of aqueducts to carry water from springs and streams to Roman cities; and among the most impressive of those was the Pont du Gard, an aqueduct bridge carrying water to Nemausus - or Nîmes, as it's known today. The three-tiered bridge is a marvel of Roman architecture and engineering. It descends in height by only one inch, with the entire aquaduct system - which runs for 31 miles in total, on a winding path from the springs at Uzès to Nîmes - descends only 41 feet; pretty impressive for a system that long, especially given the simplicity of the technology that the Romans were working with! Though the bridge fell into disuse and neglect during the 4th century as the Languedoc was disrupted by invaders, it continued to stand intact; the lower levels of the bridge were used as a toll bridge for civilians to cross the valley. However, it continued to fall into disrepair, and was significantly damaged during the 1620s when it was used to transport Huguenot artillery. It wouldn't be until 1850, when Napoleon III visited the bridge, that repair work would begin; he agreed to fund architect Charles Laisné to renovate the aqueduct, replacing eroded stone and enhancing the bridge's stability. The repairs were highly successful; in the past century it has survived not one, but three serious floods that washed away other bridges! As a work of artistic and engineering genius that stands as a testament to the ingeniuity of the Romans, it is no surprise that the Pont du Gard has inspired artists and writers since its creation. If you want to visit the aqueduct yourself, there's a great opportunity to do so on our Languedoc cycling tours; and not only that, but we take a canoe trip down the river Gard and under the bridge on our Provence Roman Heritage tours! Our tours are now open for enquiries and bookings for 2018; we have Roman Heritage tours running from June to September, and a Languedoc tour in October. And if you want to organise a private tour for six or more people, contact us to schedule it!